El Chalten is seen as the trekking capital of Argentian Patagonia. In our trekking guide we discuss different one day and multi day routes around El Chalten as well as review accommodation and campsites, discuss our budget and transport to El Chalten. 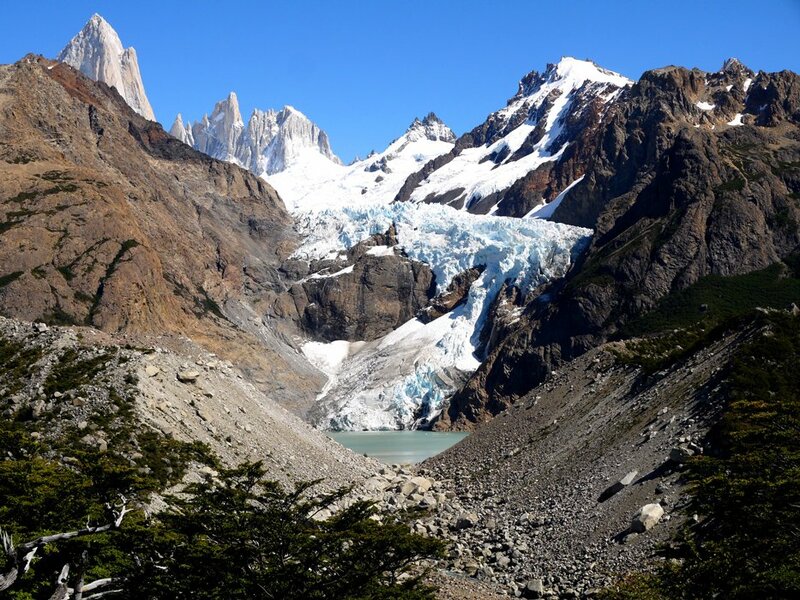 The status of the town as a major trekking destination is due to the wide variety of trekking routes accessible to all fitness and experience levels.There are spectacular views of the two most prominent peaks, Cerro Fitz Roy and Cerro Torre while camping and hiking in the park. We really enjoyed the vibe in the town, everybody is here to hike. Many people do one day routes routes returning to town every night. There are several trails leading to the main viewpoints, each taking between two and ten hours to hike from the town. The trails are well marked and free maps are available all over the town. The most popular one-day hikes are named after the viewpoint where the respective trails end. This path is an easy 45 minutes to an hour walk from town, straight past the ranger station for some beautiful views of the surrounding mountains. 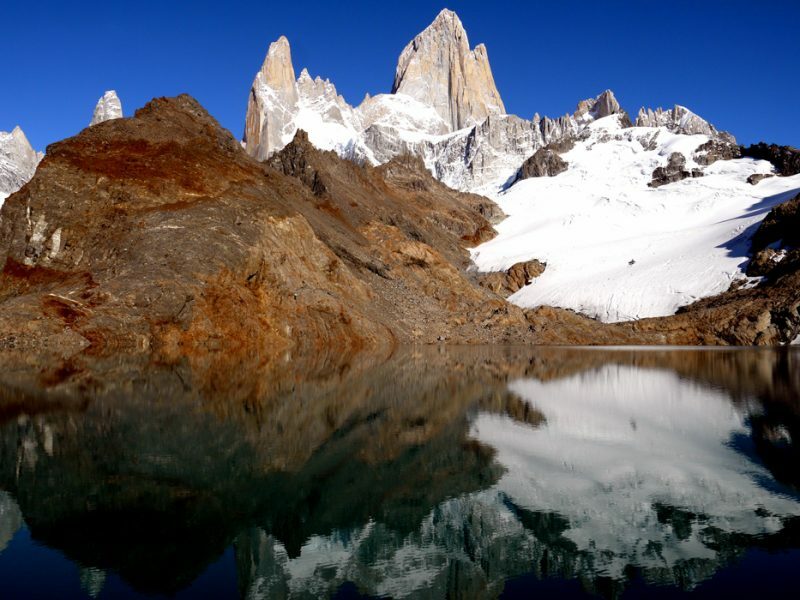 This is a great spot to walk for sunrise to see the reflection on the Fitz Roy and Cerro Torre. Walk another 15 minutes to the Las Aguilas mirador for views of Viedma Lake and Tunel Bay. The turn around point on the trail is about half way to Mount Fitzroy. This is a nice shorter hike suitable for all fitness levels with a nice viewpoint. This is a beautiful longer hike to Cerro Torre and Laguna Torre. It is a fairly flat and easy hike, it is well marked even with distance markers. Remember a snack and water. This is the longest day hike in the park going all the way to the famous Mount Fitz Roy. It is a long walk, but is flat and easy most of the way. Only when you reach the mountains for the last hour or so it is a steep up. You have long days in summer, so go for it just take it slow. Ice trekking on Glaciar Viedma is an awesome guided option, an unreal experience, but it is pricey. The tour companies will take you out Transport to the glacier is by boat, provide kitted with crampons and the necessary glacier trekking gear you go for a guided hike on the ice. Multi-day treks where you camp on the ice are also available. The park is truly for everybody with very well marked trails, fairly flat for most of the routes and there are many other hikers on all routes in season. I don’t think a guide is necessary actually El Chalten is a great place to do your first independent hike. This is not an off the beaten track place for wild adventurous hiking, but the views are spectacular and we really enjoyed it, it is an amazing place. For multi day trekking in El Chalten your options are to either combine several trails to make up a hike to your requirements or to do the Piedra del Fraile or Huemul circuit . There are four free campsites in the park where you can camp to do a multi-day hike, you can see our 2 day route below. There are two well-known structured multi-day hikes in the park; Piedra del Fraile and the Huemul circuit which is known as the toughest hike in the region. Map of Los Glaciares National park. Our route, first day; El Chalten – Laguna Capri, – camping Poincenot. Second day; Rio Blanco – Laguna de Los Tres – Mirador glacier Piedras blancas – Laguna Madre e Hija – Laguna Torres – El Chalten. Located outside of town, trail starts here, you have to register if you are planning to camp or walk further than the viewpoints, registration is free of charge. This is a nice viewpoint of the Fitz Roy Range, the walk here starts with a bit of uphill and some steps but then becomes flat. It was overcast and rainy on our first day for this reason we saw almost nothing on the first day.The laguna is 4km about 1 hour and 15 minutes’ walk from the visitors centre. The campsite is located just over an hour’s walk further. On the way we could see the glacier Piedras Blancas, almost at the start to the trail to Laguna Los Tres. The campsite had a dry toilet, water was available at a close by river. The campsite was quite full with some groups being loud until late. The lake is spectacular by any standards, the trail starts close to the campsite, Campamento Poincenot. Unlike the previous day that day we were very lucky to have a perfect sunny weather with no wind. It is only a 2 or 3km walk from the campsite, but is a steep climb most of the way. 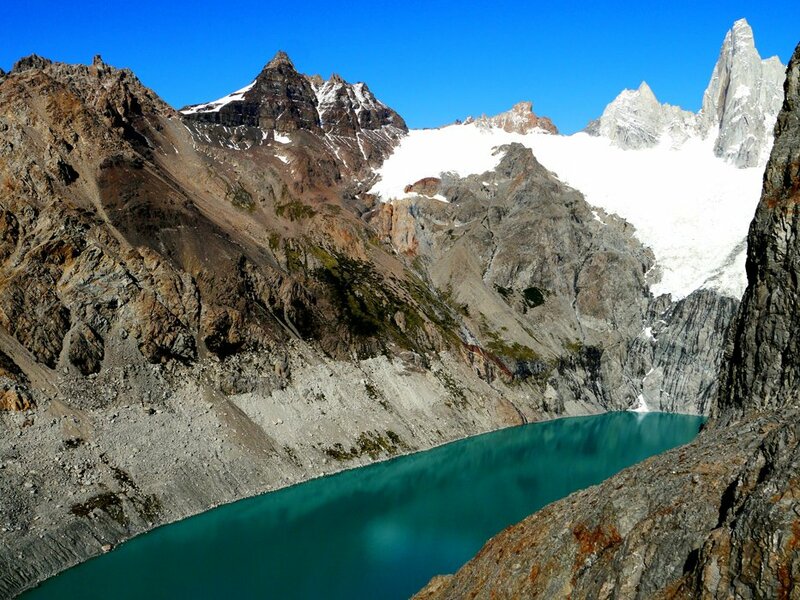 There are two lakes (Laguna De Los Tres and Laguna Sucia) and a glacier that you can see on the top. If there is no wind the reflection of the mountain in the lake is amazing. Get up about 2 hours before sun up if you want to see the sunrise from the top. This viewpoint is about 2km from the Campamento Ponenot campsite. We had a really nice view of the glacier. We walked here after coming down from Laguna De Los Tres and had breakfast. This was a long walk from Mirrador Glacier Piedras Blancas at the end of the day. It was overcast again and we did not have great views, but the views of the Torre range is supposed to be good from here. The view of the lake and it’s glacier was nice. Nice views of the Cerro Torre Range, was our last stop on the way back. This five day hike around The Huemul Mountain is known as one of the toughest and most beautiful hikes in Patagonia. This Circuit involves semi technical terrains, such us snow, glaciers and moraines. Its particular components involve different types of terrains, climbs, flora, and fauna allowing us, in only a few days, to get to know a remote places, including an amazing view of the Southern Ice Field. We have not done this hike, but understand you need some technical experience and gear to complete this hike. With a 60km length, this circuit has from 800 to 1600 mts elevations. Entering from Rio Túnel Valley up to Paso del Viento, by The Viedma Glacier up and out through Paso Huemul. You can book a 4 day guided hike of the Humuel circuit here. Don’t feel like hiking alone? 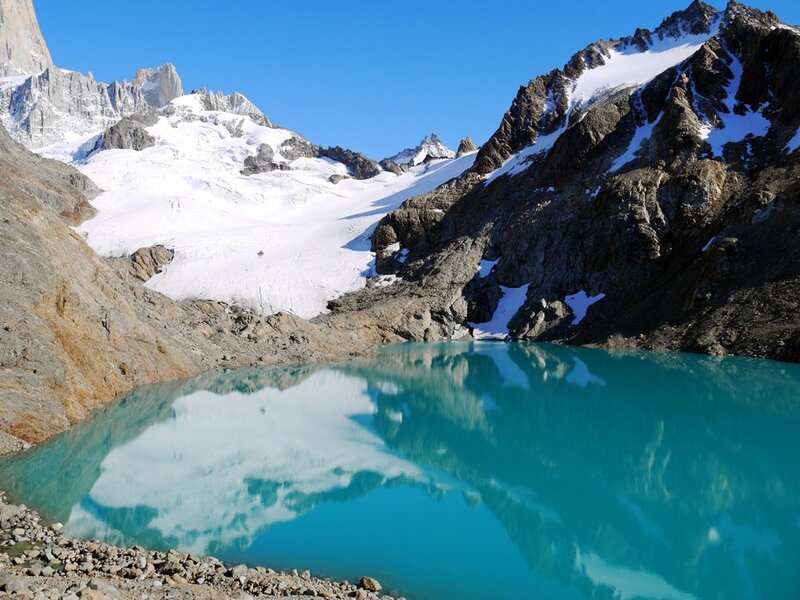 Explore this beautiful region with G-Adventures’ El Chalten experts – Trek through the crisp air of El Chalten (with its crazy beautiful Cerro Torre mountain) and then to the area near the imposing Perito Moreno Glacier. In between, marvel at the giant sky, vast views, and big city appeal of Buenos Aires while you revel in a sense of personal triumph. Here are some more Organised Hike options. 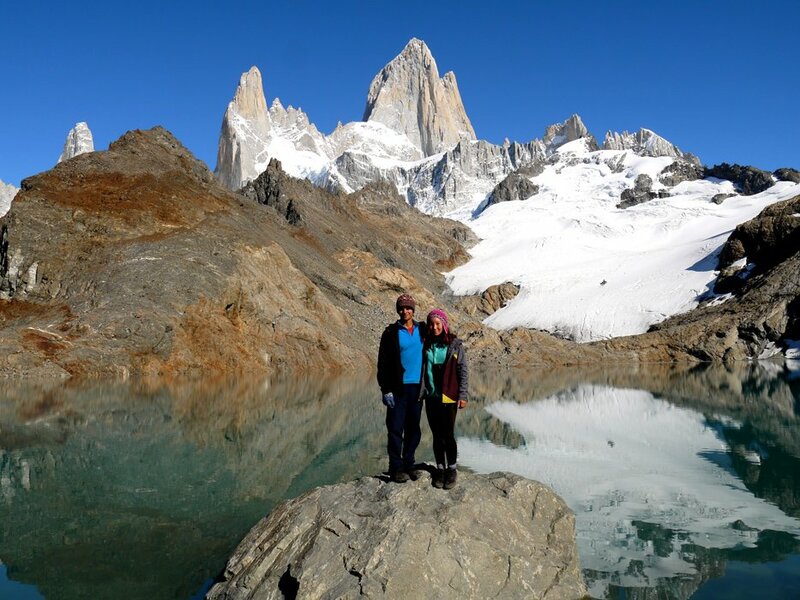 Accompanied by a mountain guide for a 16 km trek, you will visit the best views of the Piedras Blancas Glacier and the imposing Fitz Roy Mountain. Thousands of cyclists and hikers come through El Chalten every season and there is a huge variety of accommodation to cater for every budget from camping to luxury lodges. We enjoyed camping, but it is nice to return to a warm lodge, have your own bathroom and a comfortable bed after a long day hiking in the chilly Patagonian weather! Super comfort – Los Cerros Boutique Hotel & Spa, beautiful boutique hotel with stunning views 5 minutes from the trail. Our friends loved it, knowledgeable, helpful, friendly staff, super comfortable beds and a jacuzzi type bath with a view. An amazing breakfast is included. Mid Budget – Hosteria El Paraiso Alpine-style cabin with panoramic views of Fitz Roy hills, location great close to the bus stop and the start of the trails. Good value for money. Backpacker Budget – La Guanaca Nice mountain house with hill views, heated rooms, restaurant, breakfast included. Common kitchen facilities are featured. Nice breakfast, big comfortable beds. We try not to think about what can go to wrong too much when attacking a new adventure. Hiking at high altitude in a remote location, there are obviously very real risks and evacuation and treatment can be expensive. When you feel your life is in danger cost is usually not a huge concern and the trip can become very expensive. For piece of mind do the sensible thing and have proper insurance. Get a quote here for World Nomads hiking insurance that covers you to 6000m. Doesn’t matter where you live or where you are at the moment, it takes less than 2 minutes to get a quote and you can buy it online even if you are already traveling. Always read the small print and be sure you buy the correct policy. Be properly covered for injury, evacuation, gear loss, trip cancellation and trip delays. A$ 120 ($8) per person, this was the first campsite we stayed. Fantastic hot showers. Very nice indoor common area for socializing. It has a good kitchen (utensils are limited) as well as an area to do laundry by hand. Supermarket across the road. In the main road. It is the most popular as a result most expensive campsite. By the way a shared food section here was very good (area where you leave food you do not want) many camper vans and tourists left things like olive oil, good coffee etc. A$80 ($5.50) per person, Hot showers. Very nice indoor common area for socializing. Good kitchen. Small, cosy, great place to meet other travelers. Located close to the start of the trail. Donation, legendary among cyclists in Patagonia. A lady opened her house to any cyclists to stay for free. I spoke to a couple of people, they said it has turned into more of a hostel, a business, you can buy cooked meals A$30 ($2, $32). Only one bathroom. A reasonable ‘donation’ is expected for staying here. El Chalten, cozy but quite expensive little town in Argentinian Patagonia. Awesome small, cozy little restaurant, also good for take aways. Nice home made and fresh food. Nice burgers, good soup. Burgers, fries and beer – good portions at reasonable prices. Delicious after a long chilly day of hiking. Can get very full, but service was good. Show sport on TV. Good empanadas, interesting fillings, awesome snack with a beer after a hike or pack a couple as snacks for hiking tomorrow. Amazing waffles, sweet or savoury, bit expensive but delicious. The nearest airport to El Chalten is El Calafate about 220km away, the road is paved in excellent condition and the trip takes 3 hours by bus, the daily bus service between El Calafate and El Chaltén works all year round, twice per day morning and evening (3 times in season). The bus trip is crazy expensive Chalten Travel or Caltur. 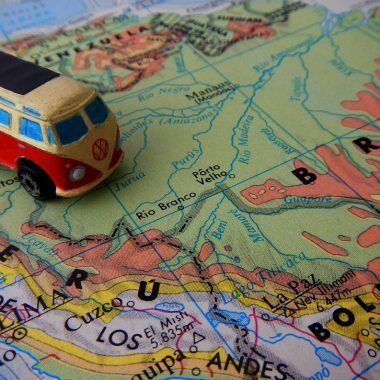 You can book a bus transfer from El Chalten to El Calafate here. Due to the expensive bus tickets many backpackers had their first hitchhiking experience here, if you decide to hitchhike, just get on the road early, we had a long day of very competitive hitchhiking here. We hitchhiked everywhere in Chile and Argentina for months, check our post Hitchhiking Carretera Austral for more details. To get from Villa O Higgins in Chile to El Chalten in Argentina was an interesting journey on foot and ferry, we walked more than 40 kilometers with all our luggage, 2 backpacks and a camera bag each, it was a tough hike that can be done in about 2 days. We walked to the beautiful glacier El Chico on the way that was a really nice detour. Good hiking shoes such as KEEN Targhee II Waterproof or more budget option – Columbia Granite Ridge makes it more comfortable on the trail. Hiking poles takes a lot of strain of your knees. There are great camp sites in El Chalten, pack a good tent – the MSR Hubba Hubba NX – it’s very light (1,3kg), packs small, easy to pitch, waterproof, it’s shape is great for strong wind and it’s durable. If you go hiking every once in a while buy one of the middle price range tents like MSR Elixir, Marmot Catalyst, Hyke and Byke Zion. An inflatable camping pad works very well and takes little space. Pack a sleeping bag, for summer synthetic such as Teton Sport TrailHead is sufficient, down Vitals Summit 20 is necessary for cold weather. Pack a stove with Piezo Ignition and cooking set. Buy enough gas for cooking in Chile it is much cheaper, Doite gas was $3 at most places in Chile, about $8 more north in Argentina and cost $15 in El Chalten. most campsites in El Chalten have a communal kitchen for cooking. Check our Patagonia Packing list for more gear recommendations. Super guide! So helpful! Me and my son are visiting Torres del Paine and continuing to El Chalten in feb/March 2019. Cheers! Super helpful post. Thanks! Questions: we are a couple and here in mid November. I’m hoping it will be warmer than it was for you. How much did it cost to rent a tent, sleeping bag, sleeping pad, basic cooking equipment (small pot, stove, gas can for stove)? per day? What was the best place to rent gear? Patagonia Hikes? Also, we have a basic Dome 2 tent from REI that sleeps 2 and I have a decent sleeping bag that I’d like to bring. Just can’t tell if my tent will be good enough for Patagonian weather/wind. Thoughts on that? Did rentals have fancy tents or do you think a basic REI tent will do us good. We are also camping for a couple of days in Terra del Fuego — so trying to see if it’s worthwhile bringing this equipment from home. In Peru before this and finishing in Brazil — so we will be carrying gear around a bit. arthi.deiva@gmail.com THank you!! Hello, Arthi! Thank you for reading! I don’t think in the mid November it’ll be warmer than in February-March, November is very beginning of the summer there. We didn’t rent anything we had our own gear and bought everything for very cheap in Cusco, Peru. You can check how much we paid for everything here https://stingynomads.com/choquequirao-trek/. Renting camping gear in El Chalten or Puerto Natales is possible but very expensive, rental prices in Puerto Natales you can find here https://stingynomads.com/torres-del-paine-hiking-guide/, El Chalten was even more expensive. If you plan to hike in Patagonia and Peru it’s definitely worth to have your own gear you’ll save a lot of money on accommodation. About your tent, I’m not sure if it has proper rain cover all over which is important for the rain and very strong wind. Our tent National Geographic OTTAWA 2 wasn’t expensive or fancy but it worked good we had no leaking or any other problem. Most rental tents we saw were local Doite tents they are quite expensive. We used our camping gear everywhere from Peru through Chile and Argentina and in Brazil for us it was worth to have it and saved a lot of money. Hope I ansered your questions.